There are many benefits of wearing a helmet camera if you are a cyclist. These include recording your journeys, particularly when you are on a scenic or unique ride, so that you can capture treasured memories. It's enjoyable to look back on your activity to re-live the excitement and share the footage with your friends and family. However, there are more serious benefits of a helmet camera, including one that you hope we all hope we never have to call on; to look back on the moments surrounding an accident. Unfortunately accidents do happen - every year in the UK there are approximately 19,000 accidents involving cyclists - so wearing a helmet camera will allow you to demonstrate to the other parties involved and, if necessary, the police, how the accident was caused. It is not easy to argue with an image on a screen depicting the whole incident and being able to call upon irrefutable evidence can be invaluable. Cyclists can also experience bad driving when they are riding their bikes and a lot of it can be a source of frustration. A helmet camera can provide an outlet for that frustration and a large community of cyclists upload videos to the internet showing poor and dangerous driving. If those drivers knew that their actions might end up on the internet, they might think twice before driving dangerously or acting aggressively. And with the power of social media growing daily, these videos can have a genuine impact. As recently as March 2014, a lorry driver was sacked for driving aggressively towards a cyclist who captured the event on their helmet camera. Helmet cameras come in a range of different price ranges but they are all action video cameras. This means they are designed to be used outdoors - in situations like being on your bike - and they all come with a range of different mounts to attach them to your helmet. By using these mounts to affix the camera to your helmet, rather than to your bike, it means the camera will see what you see, rather than being fixed in one position. 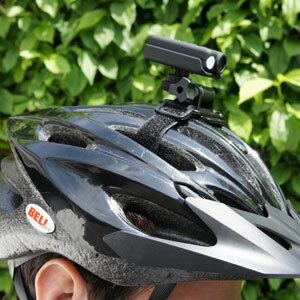 There are also other features that are important to consider when buying a helmet camera. The first is loop recording. Essentially this means you do not have to worry about running out of recording space. The system records until its memory is full and then returns to the start and overwrites itself in a constant loop pattern. This only becomes an issue when you want to recover a recording as you will have to do it before it is overwritten. Another is battery life, and you'll need to consider the length of time that your camera will be able to record for before it needs recharging. Nobody wants to be on the ride of their life only to find that their camera has stopped recording! A wide angle lens that shoots high quality video is also important: a resolution of 1280 x 720 is the minimum you should consider. Also make sure it is waterproof in order to deal with our weather in the UK and you will want it to be light and comfortable to wear. And finally make sure the controls are easy to use. Ideally you want one-touch recording so it is easy to operate while on your bike. It is unfortunate that many of Britain’s roads are not built for cyclists and it is a shame that cyclists have to put up with the behaviour exhibited by some drivers. A helmet camera, such as the RoadHawk Ride or the Replay XD 1080 Mini, gives you the advantage of the truth. This applies if an incident occurs and if you manage to avoid the incident but still witness terrible driving. Plus you will be able to record all of those interesting things that you see on your bike every day!